As measured by the Gini Coefficient (see below), the redistribution of wealth from the poorest to the richest, embodied in neoliberal ideology, rose sharply under the Thatcher government in 1979. The trend continued, albeit less drastically, under successive Tory and Labour governments where it reached a peak in 2009-10. The UK was a much more equal society during the post-war years. The data available shows that the share of income going to the top 10 per cent of the population fell over the 40 years to 1979, from 34.6 per cent in 1938 to 21 per cent in 1979, while the share going to the bottom 10 per cent rose slightly. Neoliberal ideology and inequality are emblematic of the symbiotic relationship between welfare retrenchment and the notion of the role of the state as facilitator of welfare handouts to the corporate sector. Farm subsidies, public sector asset stripping, corporate tax avoidance and evasion, government share giveaways and housing benefit subsidies, are just some of the ways in which neoliberalism continues to greatly enrich the wealthiest in society. Figures reported in the Guardian indicate that the richest one per cent in Britain have as much wealth as the poorest 57 per cent combined. The richest 100 families in Britain have seen their combined wealth increase by at least £55.5bn* since 2010. An average increase in wealth of £653m each, or £2 million each per week. Since the financial crash in 2008, the richest 100 families in Britain have seen their combined wealth increase by at least £12.57bn. ** An average increase in wealth of £151m each, or £364,052 per week. £55.5bn is the same wealth as that held by the poorest 19% of the population. £12.57bn is the same wealth as that held by the poorest 12% of the population. The problem has been that while figures show GDP, adjusted for inflation, has grown over the last 60 years (from £432bn in 1955 to £1,864bn in 2016), this increase in wealth has become increasingly concentrated in fewer hands. In other words, since the era of neoliberalism, working people who have created the sustained increase in wealth in society, have had their slice of the pie reduced dramatically. A report by Oxfam highlights the significant role neoliberalism plays in the creation of unequal societies and suggests that the most affected are more prone to conflict or instability. The report also points out that extremes of inequality are bad for economic growth, as well as being related to a range of health and social problems including mental illness and violent crime. Moreover, Richard Wilkinson and Kate Pickett, authors of the book, The Spirit Level. argue that other impacts of inequality include drug addiction, obesity, loss of community life, imprisonment, unequal opportunities and poorer well-being for children. Left Foot Forward has cited studies that illustrate the close correlation between inequality and unhappiness. The tendency to equate outward wealth with inner worth means that inequality colours our social perceptions. It invokes feelings of superiority and inferiority, dominance and subordination – which affect the way we relate to and treat each other. But instead of introducing socioeconomic policies that help reduce inequality, the Conservative government under Theresa May, have deliberately and consciously continued with the failed high borrowing-low investment/high debt neoliberal model that gives rise to it. 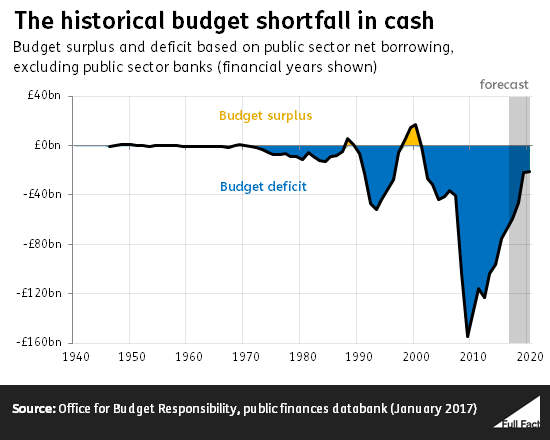 Public sector net borrowing, the widest measure of the deficit, was £48.7 billion last year (2016/17) and the gap is widening. In 2010, the coalition government said it would clear the deficit by 2015/16. Having missed the target, the stated aim is to clear it by 2026. In their attempt to cover the deficit which adds to the total stock of national debt (ie the total money owed), the Tory strategy has been to borrow. Public sector borrowing is £1.9bn higher than last year. The government borrowed £6.9bn in June, 2017, £2bn more than at the same time last year. In fact, the Tories have been the biggest borrowers over the last 70 years. This has culminated in an expected budget deficit from 2010 to 2020, of some £870 billion. This is well over the combined borrowing of Labour governments since 1945, around £490 billion. 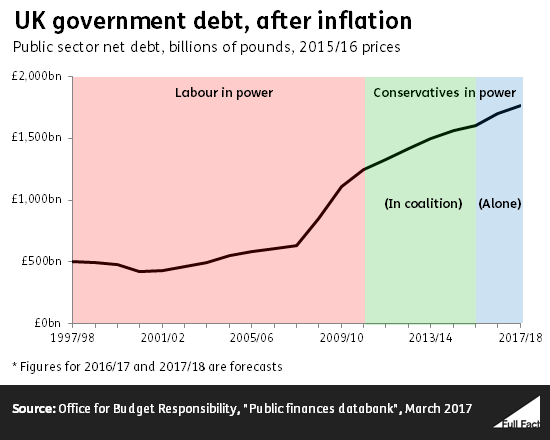 Significantly, about 5 per cent of the government budget goes towards paying interest on the national debt which under the Tories has increased in real terms by 53 per cent between 2009/10 and 2016/17 to a huge £1.7 trillion. This represents 87.4 per cent of GDP and a 3.6 per cent rise year-on-year. Author of The Production of Money, Ann Pettifor, summarizes the austerity myth in 2 minutes 17 seconds. As she astutely puts it: “Taxes are a consequence of investment and spending. They are not its cause.” The cornerstone of Tory economic policy is not to invest to stimulate the economy in order to boost growth and generate tax revenues, but to attack the welfare state and public sector which has the reverse affect. Work that the Tories claim lift the poor out of poverty, is in reality poorly paid and insecure underwritten by the tax payer which puts more strain on public finances. On the same day that the bedroom tax was announced in parliament (estimated to “save” the Treasury £480 million), the top rate of tax in the UK was cut from 50 percent to 45 percent, resulting in a loss of revenue of £1 billion. With a record level of household debt and reduced levels of household spending combined with a lack of infrastructural investment, the GDP growth rate for the first quarter of 2017 shrunk to 0.2 per cent. This is the lowest growth rate of all the G7 nations. It doesn’t leave much scope for a government apparently committed to “living within its means,” to fund anything more than the local village fete. The Tories austerity strategy began to take hold in a significant way following Chancellor George Osborne’s June, 2015 budget in which he announced £12 billion of cuts. This included the abolition of working tax credits to the poorest and the top down reorganisation of the NHS brought about by the 2012 Health and Social Care Act which removes the duty of the Secretary of State for Health to provide a comprehensive health service. The punitive attacks on the unemployed, working poor, sick and disabled have been increasingly stepped up resulting in over a million three-day emergency food supplies given to people in crisis in 2016/17. This in turn has led to increasing rates of depression, anxiety and incidences of suicides. In social care, a combination of cuts of around 30 percent to local authority budgets since 2010, increasingly restrictive eligibility criteria for services, and inadequate personal budgets are leaving millions without the support they need. Moreover, the lack of affordable housing, the reduction in housing and council tax benefits to the unemployed and sick and the imposition of the bedroom tax, has resulted in growing rates of homelessness and/or the social cleansing and displacement of entire communities, many of them long established. The existence of fragmented and atomised communities outside the confines of the workplace, the reduction in organised labour within it (illustrated by the long-term decline in trade union membership) and the lack of any safety net, means that ordinary people are increasingly vulnerable to the vagaries of “market forces”. Those affected are not just the poor and traditional blue collar workers but also the lower ranks of the middle classes highlighted by the fact that the cuts, which began to have political repercussions within David Cameron’s own Oxfordshire constituency, are now being felt in hitherto safe Tory seats up and down the country. As Theresa May’s disastrous General Election campaign and manifesto proved, the Tories can also no longer count on the elderly demographic for their vote. In an increasingly aging society, the pressure on the social care system will become more acute as demand for its services increase. But a service motivated by profit is necessarily compromised in terms of its ability to provide a universal service of care predicated on need. The electorates rejection of the Tories “dementia tax” manifesto pledge seemed to suggest that there is a limit to which an aging population are willing to vote against its own interests. There are other cuts to front-line services that are a potential cause of concern for traditional Tory voters. The slashing of 20,000 police and the replacing of existing officers with private security guards who have no powers of arrest, is unlikely to placate voters who real, or imagined, have a fear of crime that cannot be reconciled with the reduction in police numbers by such a significant amount. The governments intention is to draft private security firms into communities in suburbs and villages to fill the gap in neighbourhood policing left by the budget cuts. In an Essex seaside town, more than 300 residents have effectively been forced to club together to pay for overnight private security patrols. The implications of the drive towards a privatized police force motivated primarily by profit, are clear. The tendency would be for any crime not committed on the patch where customers pay privately for their service to be ignored or underplayed. The potential for the creation of protection rackets and vigilantism exists in situations where people who are not in a position to be able to afford for protection live near to people who are. Many who voted for the first time under Tony Blair and Gordon Brown who have suffered a decade or more of austerity and have young children of their own, are also being adversely affected by the lack of investment in education, tuition fees and the axing of housing benefit. This is the generation who are increasingly becoming media savvy and are less reliant than their parents and grandparents are on the traditional corporate forms of media propaganda for their information. In addition, unlike the older generation, they are more likely to suffer the affects of extreme forms of inequality that neoliberal capitalism has engendered. This is the alienation that Jeremy Corbyn has been able to tap into that was nevertheless overlooked by the corporate media. The truth is, the reaction of the liberal intelligentsia to the rise of Corbyn illustrated how they were caught by surprise. The fact that millions outside the elite media bubble weren’t shocked by the election result, is indicative of how irrelevant the corporate media have become and how remote they are from public opinion. As far as the political establishment is concerned, maximizing profits for the corporations they represent is given priority over the concept of a properly functioning and accountable social democratic state. Profit has become the guiding principle for the organisation of society from which everything is judged, including perceptions of success and happiness. This is reinforced daily on television programmes and in the lifestyle sections of magazines and newspapers. What underlies these contrasting perceptions is the concept of biological determinism whose proponents posit that the social order is a consequence of unchanging human biology, rather than the result of inherited economic privilege or luck. Thus, biological determinism reinforces the notion that inequality and injustice and the existence of entrenched hierarchical social structures of government, media and commerce are “natural”. But it also highlights the artificial limits that a system driven by profit imposes. Any rejection of biological determinism and the capitalist system that reinforces it, is regarded by apologists as being the fault of the individual and not the social institutions or the way society is structured. Thus, for evolutionary psychologists, sociobiologists and their apologists, the solution to inequality and injustice is not to challenge existing social structures upon which “reality” is based, but rather to alter the chemical composition of the human brain to accommodate it to this reality, or even in extreme circumstances to eliminate individuals altogether who challenge the prevailing orthodoxy and/or whose values are perceived to impact negatively on the ‘taxpayer’. Years before moving towards explicit racial genocide, the Nazis developed the notion of ‘useless mouths’ or ‘life unworthy of life’ to justify its killing of ‘undesirables’ who, like the Tories, they regarded as a ‘drain on society’. These ideas are a variant of nineteenth century ‘Social Darwinism’ and eugenicist theories, which adapted Darwin’s notion of the survival of the fittest to describe relationships within society or between nations and races as a perpetual evolutionary struggle in which the supposedly weaker or defective elements were weeded out by the strongest and the ‘fittest’ by natural selection. Intellectual challenges to market fundamentalism (neoliberalism) and evolutionary psychology that is its ideological cousin, help undermine the notion that rigid social stratification, inequality, injustice and neoliberal economics used to justify them, are inevitable. Indeed, prominent economists such as Joseph Stiglitz, Paul Krugman, Dani Rodrik and Jeffrey Sachs have for a long time been raising their voices against the neoliberal experiment. Whereas progressive venture capitalists like Hanaeur, economists like Stiglitz and Krugman and politicians like Jeremy Corbyn, understand that the functioning of a modern forward-looking society is dependent upon the reduction in inequality to save capitalism from itself, the Tories want to take us back to the vast inequalities of the time of Charles Dickens and a return to a period before the Factory Acts of the 1830s and 1840s which set down a maximum length for the working day. For the first time in generations, there exists a major alternative credible political force in Britain, that is prepared to challenge the prevailing neoliberal orthodoxy. The Labour party under Jeremy Corbyn, has shown it is serious about tackling head-on the dangerous concentration of power, wealth and extreme inequality that has been deliberately fostered by successive UK governments over the last 40 years. Neoliberalism is a political and ideological construct that can, and must, be reversed. The transformation to a more just, humane and democratically responsive system is what Corbyn will usher in if elected next time around. It’s imperative for the sake of our children and grandchildren, that we don’t let the opportunity slip. *Figures were obtained by comparing Sunday Times Rich Lists in 2010 and 2016. This £55.5bn represents a conservative figure, as 15 of the 100 richest people in 2010 fell out of the list of richest 1,000 (the full list) by 2016, and so their wealth could not be counted. The £55.5bn figure therefore reflects the wealth of the 85 Rich List figures who have remained in the Rich List from 2010-2016. Wealth was adjusted for inflation to 2016 prices. **Figures were obtained by comparing Sunday Times Rich Lists in 2008 and 2016. This £12.57bn represents a conservative figure, as 17 of the 100 richest people in 2008 fell out of the list of richest 1,000 (the full list) by 2016, and so their wealth could not be counted. The £12.57bn figure therefore reflects the wealth of the 83 Rich List figures who have remained in the Rich List from 2008-2016. Wealth was adjusted for inflation to 2016 prices. ***Figures were obtained from the median household income in the ONS’ Households Below Average Income release, 1994/95 to 2014/15 statistical release – https://www.gov.uk/government/statistics/households-below-average-income-199495-to-201415 Looking at difference between 2007/08 (£463), 2009/2010 (£469) and 2014/15 (£473) figures.